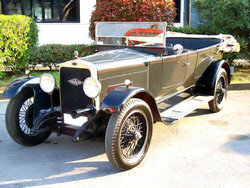 Ansaldo was an Italian automobile manufactured by an armaments concern from 1921 to 1931. The company entered car manufacture with an ohc 1847cc four-cylinder model which could develop 36 bhp at 3600 rpm. A sports version with 1981cc engine was offered, as was a six-cylinder version of 1991cc; later six-cylinders were offered with engines of 2179cc. After the First World War, the Società Gio. Ansaldo & C, established in Genoa since 1853 by engineer Giovanni Ansaldo, was looking for ways to utilize its excess production capacity, because the war had ended and the demands of war products had ceased. The Company was determined to use the plant to produce cars in Turin. That plant had been until then devoted to the manufacture of aircraft. The conversion occurred in 1918 and the first production car left the plant the following year. 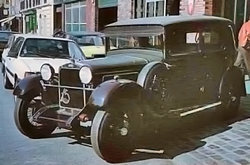 The first models were called "A" and "4B", followed in 1922 by the "4C". The sales were a success because it sold about 287 cars in 1920 and 443 in 1921. All models used a four-cylinder engine in line 1846cc., (4C in the age of 35 hp). 4C was built on a chassis of two different lengths. Short chassis models for long torpedo and chassis for the coupe body of six seats. A sports version, the 4CS, propelled by a 2.2-liter engine valves in the lead, had a young Nuvolari among its pilots. In this model was followed by 6B, which had a six-cylinder engine in line and 50 hp. 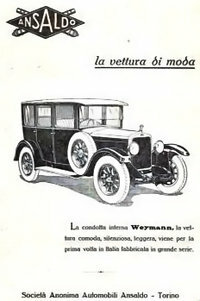 In 1923, financial problems at the company, which prompted this change of hands, disappearing the "empire" Ansaldo, however, the continued production of cars. At that time, the factory, had about 200 people nominated in 2000 and other hourly-paid workers and production between 1000 and 2000 cars per year. Between 1926 and 1929 to build the Type 10 with an engine smaller than 1.5 liters. Beginning in 1927, introduced a new range of cars with engines of four cylinders of between 37 and 60 hp, the rates were 14, 15 and 15GS. 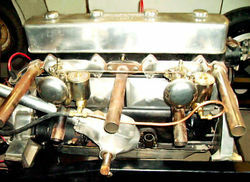 With six-cylinder engine, 67 hp 2780cc and was the type 18, and eight-cylinder engine, 86 hp 3536cc and was the type 22. These past 2 for export. Was reached to export about 400 units of type 18 and 22. At that time, there were also commercial vehicles with petrol engines, the type 300 (2 liters) and type 500 (5.5 liters), with buses and trucks bodies. Unfortunately for Ansaldo, as for many other companies at that time, the economic recession turned fatal. From 1930 the company merged and changed hands for maintaining production until the last cars were produced in 1936. Among the company's last cars was an ohv straight-eight of 3532cc. Ansaldos were generally of good quality and modern design, and competed in many races. When Wikov began manufacture in Czechoslovakia in 1928, they built the 1453cc Ansaldo Tipo 10. The mark Ansaldo continued to provide some commercial vehicles until around 1945, although these were produced by other companies. Ansaldo was also a steel and mechanical manufacturing company.